Frame finishes available in chrome or white. 1900mm height (excluding shower tray). Door adjustment 750mm - 800mm. Side panel and shower tray are supplied separately. Specifically designed for a lower budget, the Optima range ofCoram shower enclosures is smaller and has fewer features, but can still offer great performance, high quality and great value for money – making it the best value alternative to Coram Premier showers. There is a great selection of Coram shower screens and doors to choose from in the Coram Optima collection, whatever the size or shape of your bathroom. 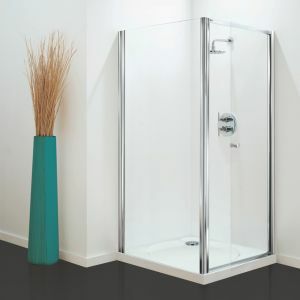 Whether you want a corner shower, a shower which rests against a wall or a shower to fit snugly into an alcove – there is a Coram shower enclosure that is perfect for you. We are also able to supply Bespoke Shower Doors and Enclosures by Coram. If you are looking for an unusual or awkward size that cannot be found in the standard door range, or you are looking for a custom shower solution, then why not vist ourBespoke Shower section. We supply the full range of products by Coram Shower. If you do not see what you are looking for, please contact us.